With a series of air strikes beginning Friday and continuing through the weekend, the United States has gone to war again in Iraq. This new imperialist military adventure has been launched in defiance of overwhelming popular opposition and without a shred of legal or constitutional authority. The decision to launch a new war was made by a handful of strategists of US imperialist policy within the military/intelligence apparatus, in league with the corporate and financial elite. It was made behind the backs of the American people, who have absolutely no say in the policies, including going to war, that impact their lives. President Obama’s Thursday night announcement authorizing the launching of air strikes and other actions against the Islamic State in Iraq and Syria (ISIS) came just one day after Anthony Cordesman of the Center for Strategic and International Studies published an analysis calling for an escalation of US military operations in Iraq. Cordesman and his Washington DC think tank occupy a prominent place within the network of intelligence and military strategists who determine US foreign policy. Cordesman and his like are involved in a permanent conspiracy against the wishes and interests of the broad mass of the American people, in which the president serves as executor and front-man. Their decisions to launch wars and subvert targeted foreign governments are dutifully approved by the leaders of both big business parties in Congress. The corporate-controlled media is assigned the task of dispensing propaganda and disinformation in support of militarism and war. Opinion polls show that 71 percent of the American population regards the 2003-2011 Iraq War with hostility. But what the vast majority of the American people think and feel has no bearing on the policies and decisions of the key actors in Washington. There is no longer even the formality of public hearings, debate or a congressional vote. No explanation is offered as to how and why a country that had no Al Qaeda presence until the 2003 invasion, supposedly carried out to fight Al Qaeda terrorism, has been largely overrun by an Al Qaeda offshoot. There is no explanation for the terrible squandering of Iraqi lives, with over a million killed, and American lives, with tens of thousands killed and wounded, or the waste of trillions of dollars to finance the slaughter. The politicians and media are silent on the role of the CIA in promoting and aiding ISIS and similar Al Qaeda-linked forces and using them as proxy fighters in the US wars for regime-change in Libya and Syria. Obama’s speech announcing the decision on Iraq was a demonstration of contempt for the views of the American people. He went on national television at 9:30 p.m. on a Thursday night, with no advance notice. The timing was determined in part by the need to begin the bombing before he left Saturday morning for his three-week holiday at a millionaire’s estate on Martha’s Vineyard. Obama made only the most perfunctory arguments on behalf of the resumption of air strikes. Only the most uninformed and naïve can seriously believe that the US government is moved by concern for the fate of innocent civilians—particularly after the month-long spectacle of Israel incinerating the people of Gaza with bombs and missiles supplied by the United States. The president’s other professed concern, the “lives of American citizens” at risk at the US consulate in Erbil and the embassy in Baghdad, is a formula for unlimited military aggression. The US government has facilities in every major city in the world. In the case of local military clashes, the normal practice is for such outposts to be evacuated, not defended by force. To do otherwise would mean American military intervention in every armed conflict on the planet. Military officials told McClatchy News Service, “There is probably some gray area” in the new US war in Iraq, indicating that the aims go far beyond the “limited” intervention described by Obama Thursday night. They noted that the most recent “limited” mission undertaken by the Obama administration, in Libya, ended in the overthrow and killing of the country’s longtime ruler Muammar Gaddafi. 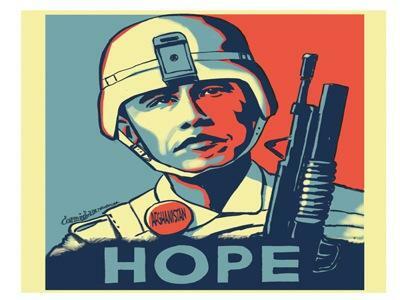 Obama admitted in his speech that renewing military operations in Iraq was deeply unpopular, particularly among those who voted for him in 2008 as a professed opponent of the war launched by President George W. Bush. He repeated a worthless pledge not to send combat troops, and then argued, “America has been able to make the world a more secure and prosperous place.” This absurd claim applies least of all to Iraq, a country largely destroyed as a functioning society by three decades of US bombing, economic blockade and military occupation. The White House indicated it would send Congress an official notice under the War Powers Resolution that combat operations have begun in Iraq. But Obama aides said no congressional authorization was required because Obama had legal authority to order the use of force to protect American troops in Iraq—the troops he sent to Iraq less than two months ago to serve as a trip wire to justify further US military action. Earlier this year, White House aides testified before Congress that the president as commander-in-chief had the power to order US military action anywhere in the world, including the invasion of a country, without any congressional authorization. The renewed bombing in Iraq represents an assertion of this untrammeled and quasi-dictatorial power. Obama declared Saturday that the intervention in Iraq would go on for months, if not longer. It thus represents an open-ended commitment of the military and financial resources of the US government. Tens of billions of dollars will be thrown into the furnace of war to secure the interests of American imperialism in the vast oil resources of the region. Who will pay the price? The Iraqi people, through death and devastation, and the American people, who will be told, once again, that there is “no money” for jobs, pay raises, pensions or other social benefits. The renewed military intervention in Iraq is only one component in a far broader imperialist agenda. Obama’s so-called “pivot” to Asia does not mean shifting the focus of American imperialism from the oil-rich Middle East to a confrontation with China. It means adding the Far East to the Middle East, Central Asia, Ukraine, Libya and countless other areas where US imperialism is preparing to carry out aggression. The continued control of a cabal of CIA, Pentagon and think tank conspirators, operating in conjunction with the American financial oligarchy, over US political and economic affairs poses a mortal danger to the future of all humanity.